Place orange juice, caster sugar, cinnamon stick and cloves in a small saucepan; cook over a low heat, stirring, until sugar is dissolved. Thinly slice oranges; place slices in a large heatproof jug or bowl. Pour juice mixture over slices. Cover and refrigerate for several hours or overnight. Remove spices; stir in red wine. Just before serving, stir in lemonade. 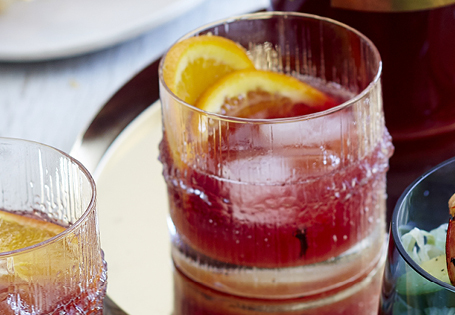 Serve Sangria over ice in tumblers.